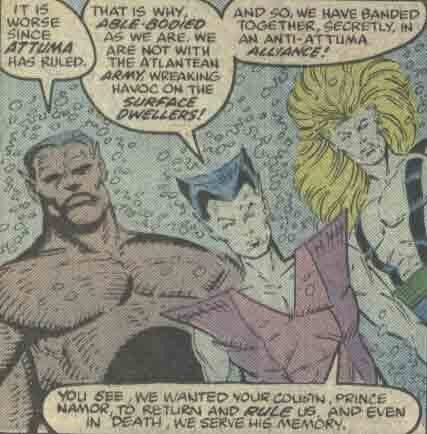 History: (New Mutants Annual#5 (fb, BTS))- While Attuma was the ruler of Atlantis, three young Atlanteans who had developed genetic mutations as the result of atomic testing in the Maritania settlement, making them outcasts in the eyes of Attuma, decided to turn against Attuma, and fight to have Prince Namor restored to the throne. (New Mutants Annual#5)- When the three Atlanteans found a squad of Lemurians and Deviants attacking Namorita, in search of the Horn of Proteus, they came to her rescue. 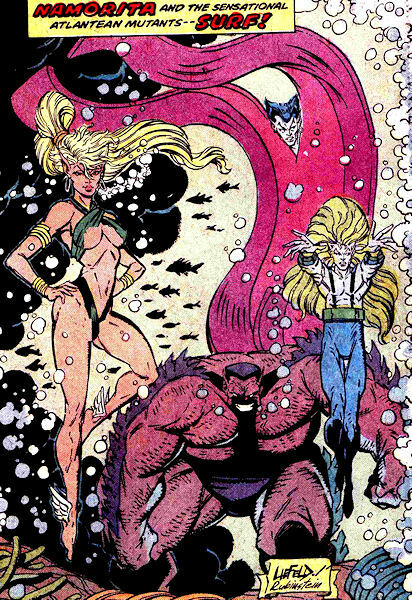 Namorita at first thought they were her enemies, but after learning who they were, they decided to join forces. Having mistaken three of the Deviants for members of the New Mutants, Namorita led them to the surface for an assault upon the innocent New Mutants. 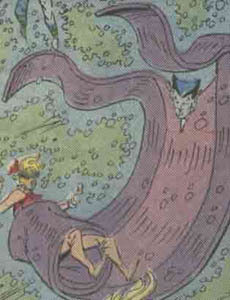 However, close up Namorita realized her error, and called off the attack. When Namorita heard the Horn of Proteus, having been blown by Ghaur, she led the New Mutants and her comrades (now calling themselves "SURF") underwater to oppose the sea creature Ghaur had summoned up, as it assaulted Atlantis. 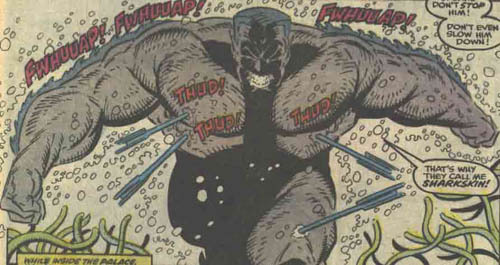 Undertow and Rictor were able to lead the creature away from Atlantis with their powers, and Eel destroyed it by carrying one of Boom-Boom's time bombs inside of its mouth. Although Atlantis had been evacuated by its citizens, the members of SURF vowed to defend their city nonetheless. (Avengers West Coast Annual#5/3)- Sharkskin, Eel and Undertow invaded Marine World, wanting to set the killer whales held there free. Members of the Avengers came to oppose them, and Dr. Pym managed to shrink the whales down and remove them from the water, so that Firebird could heat the tank up with her powers, driving SURF out. When SURF realized that the Avengers meant the killer whales no harm, they were finally convinced to let the creatures remain in captivity, although they were disgusted to see the creatures entertaining humans for food. Comments: Created by Louise Simonson, Rob Liefeld and Tim Dzon. The main image is a poster in New Mutants Annual#5 which shows the entire team nicely. Eel is an Atlantean mutant with the power to stretch his body. Sharkskin is an Atlantean mutant who possesses thick skin to defend himself from attacks, and has spines along his arms and back which can tear through other substances. Undertow is an Atlantean mutant with the power to control water, allowing him to generate waves, water spouts, and blasts of water.